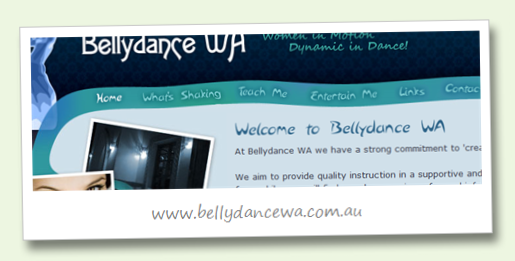 The Starfish team are proud to announce the launch of a new web site for Bellydance WA. School director Renate van Dordrecht wanted a stylish and exciting new site to promote the classes and festivals that Bellydance WA run. Of particular importance was the ability for Renate to easily maintain the content on the site, and update the class schedules. And of course, the site had to have a look and feel (and flair!) to match Renate’s classes! Bellydance WA is sponsoring the 2008 WAMED dance festival, so Renate wanted to provide all of the event information in a clean and easy to read way. We setup the new site to be maintained by Renate in Adobe Contribute, with the "What’s Shaking" section powered by the WordPress blogging engine. We also set up an easy to manage mailing list system for keeping students and other interested people up to date on happenings around the school and the art of bellydancing in general. We wish Renate all the best for WAMED 2008!